A collection of tea break musings from the team, generally not remotely related to work or endorsed by the company! Today the Large Hadron Collider (LHC) at CERN was switched on for the first time. Despite speculation that the World would end it is still here as I write this. However, it isn't up to speed yet, we are trying to get our heads around the mathematics of it all. If the device is 27 km long and the beam will travel around it approaching the speed of light then why are they getting excited when after 20 minutes it went half-way around? That equates to 81 kmh or around 50 mph which is about the speed we can manage in our transits with a full load of screed hoses and the screed pump in tow. We have decided to try our own experiment along similar lines by connecting eight screed hoses end-to-end and hiding them under a tarpaulin. However, we have now reached our first hurdle, there is no way we can get any particles into the closed loop. Although Phil has pointed out that there are already particles of screed in there so they would probably do the job. We bought a big magnet from Woolworth but so far have been unable to get the screed particles to move through the hoses at any speed approaching 51 mph, or any speed at all. Having decided that we are not cut out to be physicists, we are going back to our underfloor heating and screed jobs. On a serious note (well serious for us) congratulations to the team at CERN headed by our very own Lyn Evans. Lyn, from Aberdare, attended university here in Swansea. 27/08/08 Psst.... wanna buy a domain name? Now because they were concerned about this, as he wanted to redirect all these to his personal Web site, livebwd.com wanted to give us the opportunity to register them for 10 years at the cost of £500. How very kind of them you might think, but of course we had to act quickly because his application was pending and he'd paid using someone else's credit card which also made them suspicious. Now apart from the fact that some of the domains above cannot be registered for 10 years at a time, and the fact that they contacted us in the first place because someone wanted to register 5 domains, we were also suspicious. We declined their kind offer and suggested that they allow Mr Hewitt to proceed with his registration. Imagine our total lack of surprise when we discovered this morning that all of the above names are still available! If you haven't already worked it out yet - IT IS A SCAM. Look - it practically originated on our doorstep all those years ago. Not wishing to be outdone by their English cousins, The Driver and Vehicle Agency in Northern Ireland have admitted that a couple of CDs have gone missing. The report states that the data includes the keeper's name, address, registration mark of the vehicle, chassis number, make and colour. Later reports say that these were posted on the day that HMRC revealed their loss. On Wednesday, the head of Northern Ireland's Driver and Vehicle Agency said drivers' details "should not have been posted the same day it was revealed 25m people's details were lost". and Brendan Magee, head of NI's said he would now "clearly have to look" at his own position. Also today Leeds Building Society has mislaid information containing the personal details of its 1,000-strong workforce. In the light of these revelations which have floored everyone, we have decided to look at our own procedures and security screeding (sorry, screening) over a liquid lunch. Ray has lost a pencil, it was on the desk but a thorough search of the area including the floor has revealed nothing. We can confirm that this pencil was never used to write sensitive data of a financial or personal nature. Nigel has lost one of his balls. It was a big orange one that he used for cleaning out the liquid screed pipes after floor screeding. At this stage we cannot confirm that the ball did not contain any sensitive data. Phil has lost his mind, although this is not news, and we are happy to report that there is absolutely no risk of loss of data as the mind never contained anything useful prior to its loss. Initial investigations indicate that the mind loss may go back as far as the BSE (Mad Cow) incident in the late 1990s. Apparently Phil bought a load of beef on the cheap and kept it in the freezer it until the crisis was over. Not to be outdone by HMRC the DVLA are now sending out information to the wrong people. See the story, we were wondering why they filled in some of the answers anyway? To the officials at the Pavilion Theatre in Gorleston, Norfolk that have banned the throwing of sweets in case they injure someone. We say - take them out of the jars first! Dropping them on the floor to be distributed by ushers is not the same. Before you get too excited, these are names not pounds, although to some people they will amount to the same thing. Apparently the entire child benefit database from HMRC in Washington, Tyne and Wear, and the data includes names, dates of birth, bank and address details. Experian has warned that "Children whose personal data has gone missing could be at risk of identity fraud for many years". In the same article it is reported that "Chancellor Alistair Darling has stressed that so far there is no evidence that the missing data has fallen into criminal hands." Isn't this like saying that so far there is no evidence of anyone stupid or corrupt in government - we all know it will happen but not when. It is reported that the NAO wanted only limited child benefit records but was told in an e-mail from a senior business manager in March that to remove more sensitive information was too costly and complex. No doubt because this system complies with the requirements of all government initiated systems. That is it probably took twice as long to implement, went 500% over budget and doesn't do anything that was actually needed! So between HMRC and the banks we needn't worry about identity theft, nobody needs to steal it, it's being given away! Someone sent me a link to "Cats In The Kettle" which is a funny reworking of Harry Chapin's "Cat's In The Cradle" and I went in search of some more information on it. Now Bob is an American "Jock" on KZOK 102.5 FM, which would normally be enough to put me off, and has a Twisted Tunes section on his Web site which is well worth a listen if, like us, you have a warped sense of humo(u)r. Hear old favourites like "Chipmunks Roasting On an Open Fire"
.... or some similar rubbish. Shame the driver that pulled out in front of me whilst still indicating left didn't have another one in the front for her own benefit saying something like "learn to drive before I orphan my children". Picture the scene, I'm driving past the Cemex plant in Llanelli on the way into work (No they don't do Supaflo liquid screed from this plant so I can't fill the boot!) when out she pulls and then has to brake because she can't negotiate the car parked in front of her. Why is it that parents put this type of notice in the back of the car and then proceed to drive like morons. Hello out there - these are not some sort of talisman to ward off evil spirits and keep your children safe no matter how much you endanger them by your own stupidity. Neither are they permits that allow you to park on zig-zag markings or even zebra crossings outside your child's school. Only by chance I heard on the radio that Chad Varah (Rev Dr Chad Varah) had died last night. The name, I admit, meant nothing to me but the news report mentioned that he had founded the Samaritans. Now I'd never given any thought to when it was founded and by whom, it had always been there or so it seemed. The realisation that the person responsible was living until yesterday made me want to investigate. The BBC carried this obituary and more information can be found on the Samaritans Web site. I confess that I am not often moved by the death of someone I haven't met but reading these brief accounts of his incredible life, work and attitude moved me. He will now go to the top of my list for "people I wish I'd known", to be honest he's the only one on it! I had a look at Amazon and ebay for his autobiography "Before I Die Again" and found that used paperback editions had prices ranging from £57.73, were they this much before yesterday I wonder? I must check my local library. 16/10/07 Man fined for putting litter ...... in a bin! Click on the link above for the story but in essence - man puts bag of kitchen waste in litter bin on lamp post and council fines him. Apparently these bins are, according to a council spokesman "for everyone to use". Everyone except 84 year old Mr Richards it seems who was accused of fly tipping. Obviously Boston in Lincolnshire doesn't have the same problem as we do, with people throwing the odd mattress over a hedge or leaving it in a lay-by. Nor do they suffer from roads strewn with McDonalds packaging that has been thrown from cars. There again they probably do have the problem, but bringing these people to book would actually involve doing some work, it is far easier to find an address in a bag of litter that has been considerately disposed of and harass that person instead. Shame on you, so called civil servants in Boston Lincs. This story has similar undertones to the incident in Swansea last year when Michael Reeves, was fined £200 for disobeying rules about sorting his rubbish. His crime - putting a piece of paper in a bag for bottles and cans! Something that he denies incidentally, but even if he had does it really warrant a £200 fine and a criminal record? Hang the bugger and have done with it that's what we say! According to Charlotte's Web site www.charlottechurch.com the newborn has been named "Ruby Megan Henson". This prompted some comments from the screed department, "just as well they didn't call her Church or she'd end up with nicknames like Cemex or Supaflo". Yes, they are a strange bunch in the liquid screed department! For those of you that aren't involved with screed or concrete the above might need some explanation. Ruby Megan Church = RMC, RMC was the previous name of Cemex, Cemex produce, amongst other things, Supaflo liquid floor screed, which is one of the products that our screed department use - yes I did say they were odd! All that aside, our congratulations to Charlotte and Gavin and welcome to Ruby. Now the question is, as she grows up, will she be supporting Cardiff or Bridgend? Well alright, that may be a slight exaggeration but he certainly helped pour oil on troubled waters. I was celebrating my birthday on the Thermotech Underfloor Heating stand at Grand Designs Live in the NEC. Being the opening night there was an Exhibitor Party at the end of the day. Now, bearing in mind that my wife thought that I was working away (with the emphasis on working) when I called her on my mobile all she could hear was the music and laughter of jolly people. Apparently I should have been working not having a good time, was I really in Birmingham? 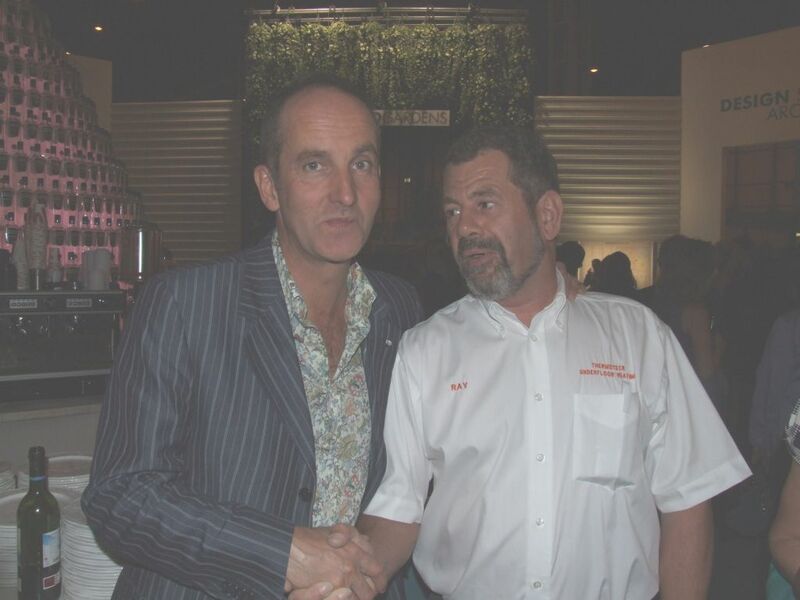 Many thanks to Kevin McCloud for agreeing to pose for the photograph below (click on the thumbnail for the full size) as proof that I was at Grand Designs Live and not an International Beer Festival. 20/02/2006 I Can Read Your Mind! 14/02/2006 Mayday, Mayday my set top box is sinking! A Plymouth pensioner's set top box sparks mayday alert. Fed up with telemarketers? Most of us are. This counterscript for telemarketing calls, which is from the Netherlands, could be the antidote. Or at least one way to turn the call into a more pleasant experience. 29/12/2005 Cheaper Fuel for All? 19/12/2005 What a Name - We Love It! The winner of the 3rd Yell Best Business Names competition is a Chichester based company named "All Cisterns Go". Congratulations to them, both for winning the competition and for sharing our sense of humour. Not new judging by the date of the press release, but new to us. Can't say that we are that impressed with the look of it but what a great idea. No air in the tyres so no punctures. Sadly I can no longer find this article on the Michelin site but thanks to the Internet Archive it can be viewed here Read the Press Release Please note that there is a delay in loading this page. A novel present for someone you like, or not. Chocolate covered ants from Firebox.com I wonder why they are sending me a catalogue - who's been talking? Now if we were being defensive we could ask what country gave us stripy jumpers and frogs legs? Olympic rivalry or just good old off the wall humour? 30/06/2005 An ID Card with Double Points? Perhaps they will be sponsored? What about travel agents sponsoring passports and driving schools sponsoring driving licences too? 27/06/2005 We've Arrived - at Glastonbury? We heard this one on Radio 2 but weren't able to find a link to the story, if you know of one then please let us know. In an effort to beat increased security at the Glastonbury festival an enterprising group of would be visitors discovered which company provided the portaloos. They stowed away in the loos while they were still on the lorry in the yard. When the lorry stopped they leapt out to find themselves in Membury service area on the M4!